Michelle Xue is a student at Georgetown University and climber from San Ramon, California. She has been climbing for 3 years now and has been addicted since her first day at the gym. 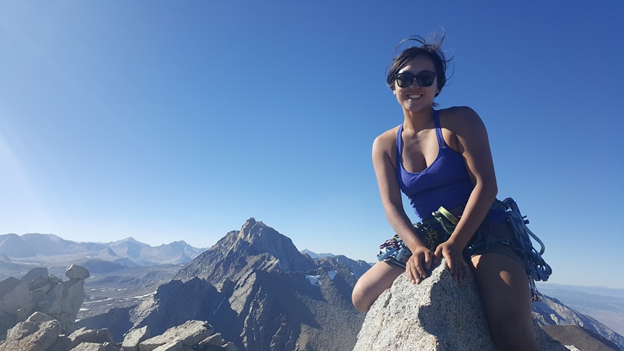 She has spent much of her time in Yosemite and the Eastern Sierras cragging, alpine climbing and mountaineering before starting school. This past Summer 2017, she won the AAC LYD grant and attempted to climb Nevado Sajama 21,463 ft and other smaller peaks in the Cordillera Real. She is stoked on rock, snow, ice and alpine climbing. When not climbing, she can be found training, researching new climbs, and cooking. Currently, she is on the club rock climbing team at Georgetown University and competes in local climbing competitions.